<b>HANDS-ON:</b> The project-based learning at Dos Pueblos Engineering Academy is good prep for the real world and a big draw for female students interested in science and engineering. As schoolchildren enter a swiftly arriving future filled with new knowledge and technology, many American classrooms struggle to stay apace. At the same time, though, mounting challenges have forced educators to teach outside the box, and according to a two-hour television documentary set for broadcast on September 14, “the science of learning [is] creating a new vision of the future of education for all children.” Produced by WGBH Boston and Nova ​— ​the most-watched prime-time science series in the U.S. ​— ​School of the Future takes an in-depth look at changing educational landscapes across the country, including those inside Dos Pueblos Engineering Academy (DPEA) at Dos Pueblos High School. 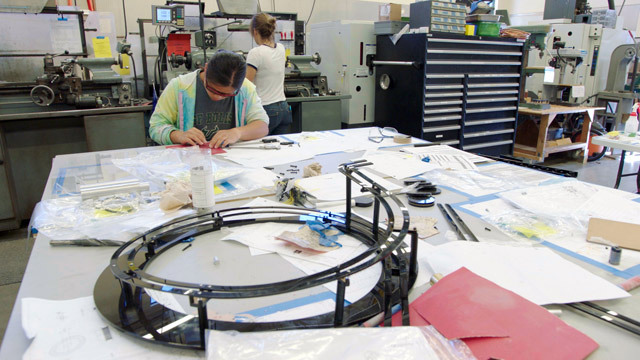 The segment follows 2016 graduating senior and star softball pitcher Madison Pickett as she works alongside classmates to conceptualize, plan, and fabricate their award-winning “Physics Arcade” year-end installation for the Maker Faire competition held in Northern California. While the narrative describes the need for students “educated in the way technology works,” according to DPEA founder and physics teacher Amir Abo-Shaeer, it focuses primarily on his success closing the gender gap in science and engineering. Early on, academy enrollment was just 5 percent female. Now, it’s up to 50 percent, thanks to active recruitment of female students and the integration of more art-based coursework in its design projects. “The first thing is to just make it more accessible,” Abo-Shaeer says in the documentary. “It’s mirrors … rather than windows: We [are presenting] this so anybody can see themselves doing it … as opposed to [them] looking through a window at an opportunity that somebody else is taking advantage of.” Dos Pueblos will show the 9 p.m. September 14 premiere broadcast of School of the Future at the Elings Performing Arts Center. Doors open at 8:30 p.m.; the event is free and open to the public. In related news, Abo-Shaeer and Pickett ​— ​who’s now studying engineering at MIT ​— ​have been invited to the 2nd Annual White House Next Generation High School Summit, held on September 12 in Washington, D.C. The event highlights students, educators, philanthropists, and entrepreneurs reinventing high school curriculi and college and career preparation. Abo-Shaeer will join Nova producers in a talk about classroom innovations.